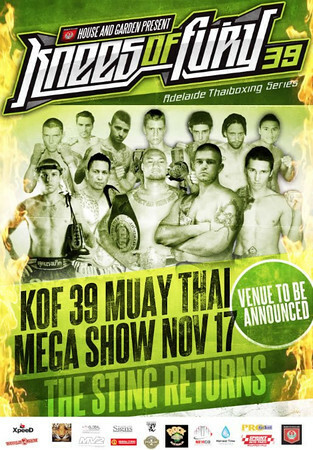 Sheppster Promotions of Adelaide, Australia has announced a new event of the Knees of Fury Thaiboxing Series. The latest will feature hometown favorite Paul Slowinski, a former protege of Alan Wong of Flinder’s University Muay Thai. Wong is noted for his Thai style and Slowinski still carries that very signature style of fighting. Slowinski for a time was under K-1 star Ernesto Hoost’s tutelage during Slowinski’s run in K-1’s initial incarnation. Slowinski has been an interesting heavyweight to watch since my earliest introductions to him on the Japanese Shootboxing series where he won handily. Slowinski has since then definitely progressed into becoming a very complete Thaiboxer. His opponent Antz Nansen comes from New Zealand and has been busy fighting in MMA events in which he has a mostly winning record. He has also taken home some championships wins including the International Muay Thai Federation championship at heavyweight in new Zealand. In their 39th event, Knees of Fury returns with an emphasis on heavyweight fighters and fights, with two of the fighters weighing in over 100kg or 220 lbs. One being Paul Slowinski and the other reportedly by Knees of Fury’s promotional team to be Charles August who formerly fought at a comparably modest size of 80kg/ 176lbs. The card is entitled after the headline fighter Paul Slowinski’s nickname of “The Sting”. Slowinski is something of a hometown favorite having come from Adelaide after emigrating from Poland and becoming Wong’s student in Muay Thai. The card is still being fleshed out as of the time of this writing but most of the matches are confirmed. The event will be coming to the Adelaide Arena, in Australia. Tickets can be purchased here. Doors open at 5:00 pm and fights begin at 6:30 pm. Below is a clip of Charles August training at Fairtex a few years back.